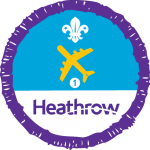 The Air Activities Staged Activity Badge can be achieved from Stage One through to Stage Six. In addition to the above, you should perform the following flight calculation: imagine you’re planning a cross-country flight of at least 60 nautical miles, at an airspeed of 90 knots. What would the time of flight be, from an overhead starting point to another overhead destination? Your assessor will give you a head or tail wind to factor in when you’re working this out.